Simon Steensland hails from Sweden, and makes a living as a professional musician composing and playing music for theatre productions. The list of plays he has contributed to is rather impressive. He describes his albums away from the “day job” as “hobby music”, and Prog Archives lists five releases previous to A Farewell To Brains, going as far back as 1993. A self-effacing and self-taught multi-instrumentalist, who is actually far more skilled than he gives himself credit for, Steensland has surrounded himself with a mightily impressive supporting cast, including long-time friend and bass player Guy Segers of Univers Zero fame, and the much in demand drummer Morgan Ågren. With a rhythm section like that you can’t go far wrong. Steensland says “As long as I can make it sound good to my ears with my limited skills, I’m fine. I don’t think you actually HAVE to be good at playing to be able to play fantastic music”, and he’s certainly right there. His friend Segers offered him these wise words in encouragement: “You have to know why you are there”, and once that is achieved anything is possible, as this sonic film-noir proves in abundance. Much as I might want it to have been, “A Farewell To Brains” was never going to be a soundtrack to a long-lost episode of the recently revived 60s puppet show Thunderbirds. 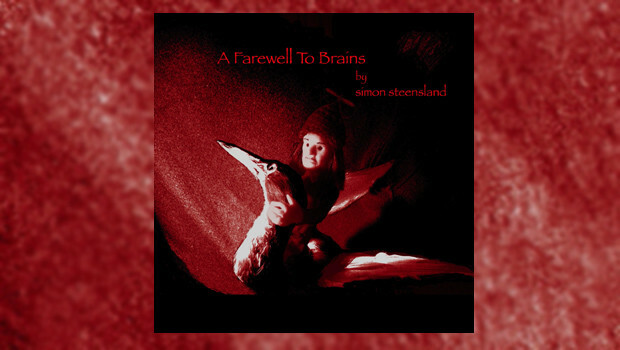 No, just one look at the dark blood-hued imagery of the CD cover and booklet tells us that Simon Steensland has been living in a black corner of the psyche with his muse. The results are quite surprising, a broiling and brooding mass of dense music that manages to be eclectic and heavy without too many identifiable tropes, remaining as it does largely cliché-free. The album is built around three long pieces, linked by two shorter bridges. The first of these mini-suites is album opener Schrödinger’s Cat which sets the scene with its stark, near impenetrable soundscape. Opening with a crash of hands on a piano, the instant and strangely rubbery bass guitar pummels out a furious charge of sinister notes, and the avant-symphony commences. Driven by the impeccable rhythm section, the instrumentation is many-layered, ominous and complex. Calmer sections of menace featuring keening clarinets highlight the symphonic nature of the work. There are hints of Zeuhl, modern classical and avant-rock in this piece, and indeed throughout the album, all underscored by a tangible European arthouse cinematic atmosphere. We still do not know what went on in the box. The spaces left in ONE contrast nicely with the dense forest of Schrödinger’s Cat, and a version of calm, albeit dislocated briefly descends on the listener. A mournful cello slithers as hollow notes reverberate all around, the waveforms becoming ever more agitated…and then back to suspense. A masterful arrangement from someone who professes “limited skills”! Robert Elovsson (Mats/Morgan Band) contributes some nifty synth work before the sawing climax sends the listener back into the black. After the massed anti-choir give us an avant-inclined rendition of The Lord’s Prayer in Norwegian, we head off into what I can only assume is Steensland’s musical imagining of Dostoyevsky’s The Idiot. The saintly protagonist finding that the best escape from a mad and avaricious world is to be found while incarcerated in a sanatorium surrounded by many dark knights of the soul is a theme disturbingly transmitted through the music. Brief glimpses of peace permeate the thunderous cacophony, lent an extra edge by Guy Segers’ contributions, not just on bass guitar, but also via his voice and treatments. Again the clarinet relays both hopefulness and despair, the latter emotion underlined by trombone, and this piece is another gloriously dark and triumphant accomplishment by all concerned. I have had this album a long time, and played it repeatedly before penning this review, and it has not been the easiest to get into. Once locked in the madhouse with the music grinning maniacally an inch from your face you will find it a rewarding if intentionally unsettling experience. Not for the faint-hearted.